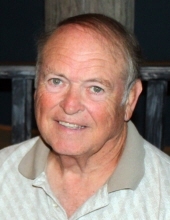 Celebrating the life of Robert Paul Herriott, Sr.
Obituary for Robert Paul Herriott, Sr.
Mr. Robert Paul Herriott, Sr., age 75, of Carrollton, Georgia died, alongside his wife, Thursday, April 12, 2018. Mr. Herriott was born in Alameda, California on December 9, 1942, the son of the late Jack Adair Herriott (aka Charles Jack) and Viola Vivian Van Ornum Herriott. He was a graduate of the United States Naval Academy and served in the U.S. Navy as a pilot during the Vietnam War. He later retired from Delta Airlines as a Captain. He was a member and former President of the Golden K Kiwanis Club, advisor to the Action Club, and a member of Midway Church. He is survived by his daughter, Robin Marie Moreland of Harrogate, England; sons, Robert Paul Herriott, Jr. of Princeton Junction, New Jersey and Darren Robert Herriott of Carrollton; grandchildren, Addison Herriott, Glenn Moreland, Connor Herriott, Benjamin Herriott, Sydney Herriott and Ethan Herriott. Along with his parents, he was preceded in death by his brother, Jack Adair Herriott, Jr.
A Celebration of Life Service will be held Wednesday, April 25, 2018 at 2 P. M. at Midway Church with Pastor Todd Wright officiating. "Email Address" would like to share the life celebration of Robert Paul Herriott, Sr.. Click on the "link" to go to share a favorite memory or leave a condolence message for the family.